This marble sculpture, created in 1819, is among the oldest works of art in the U.S. Capitol. 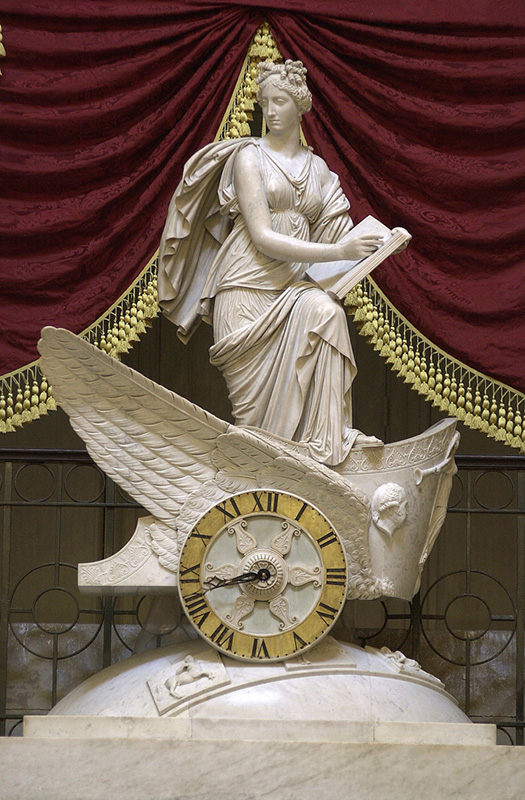 It depicts Clio, the muse of History, holding a book in which she records events as they unfold. Clio, the muse of History, stands in a winged chariot, or car, representing the passage of time. The car rests on a marble globe on which signs of the Zodiac are carved in relief. The chariot wheel is the face of the clock; its works, installed in 1837, are by Simon Willard. The room in which the sculpture stands was originally the Hall of the House of Representatives. The House moved to its present chamber in 1857, and in 1864 the room was set aside for the display of statues donated by the states; today, it is known as National Statuary Hall.